This photograph shows inmates Ralph Shiffer, 8886, and William Carey, 8269. Ralph Shiffer was received at the Kansas State Penitentiary on April 7, 1899 from Garfield County, Oklahoma for larceny. 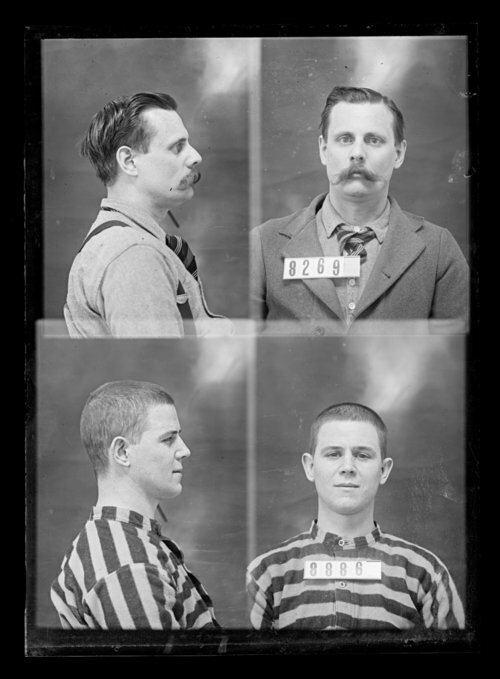 William Cary was received at the penitentiary on October 2, 1897 from Cherokee County, Kansas for grand larceny. Also known under the alias George Williams who was arrested on April 24, 1889 for forgery under prisoner number 3390.